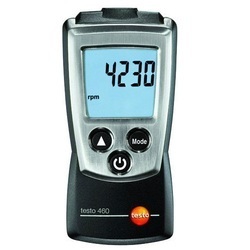 We are offering a wide range of Digital Tachometer Model DT2001B. This instrument has micro controller based design and LCD display. 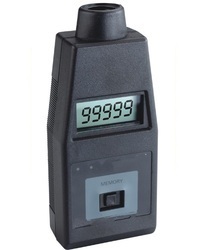 Our range of Digital Tachometer is portable, durable, lightweight and strong. We have provided these instruments with memory facilities so that measured value can be stored for future reference. RPM measurement from 1 RPM up to 99,999 RPM. Portable, Lightweight, Strong and Elegant ABS Enclosure. 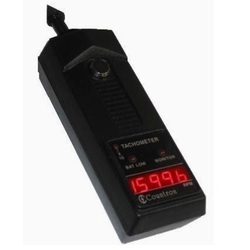 Our clients can avail a huge range of Portable Digital Tachometer Model CT100. This instrument is used to measure rotational and surface speeds. The results cn be easily read in varying light conditions due to LED display provided in this instrument. A Digital Tachometer is a rugged, reliable instrument providing accurate results. Rotational and Surface speeds displayed by seven segment Light Emitting Diodes (LED)can be read in varied ambient light conditions. The transmission shaft balanced on two lives lubricated ball bearings, is designed to have a minimum loading on the rotor. The memory circuit facilitates measurement of speeds at places not easily accessible to read and helps to retain the data. Storage in memory is indicated by an LED. Another LED is provided to indicate the Low/Normal condition of the Battery. We are manufacturing and exporting a vast range of Portable RPM Optical Instrument 460. These instruments are used for measuring maximum and minimum values. Our range of Portable RPM Optical Instruments is durable, efficient and delivers accurate results. A Protective cap for shaft storage Incl. calibration protocol. We are engaged in manufacturing Mains Operated Tachometers Model DT2006. Our wide range is available for 1 to 99,999 RPM and covers all applications. These tachometers are efficient, durable, accurate, compact designed and visible from long distance also. Wide range : 1 to 99,999 RPM - covers all applications. Bright red, 5 digit, 0.3" LED display visible from long distance. Quartz Crystal and EPROM based - very high accuracy (upto ±1RPM). RPM Based on interval between two reflections. Works on Single pulse per revolution sensing - no mounting of gears/discs etc. required. Small size : 72x72x138mm (HxWxD), Front panel conforming to DIN Standard Panel cut out 68x68mm. 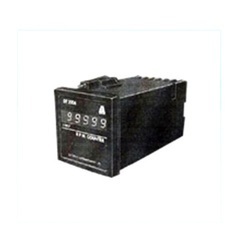 Works on input supply, 230C AC, ±15%, 50 Hz. Looking for Digital Tachometers ?